Great to see it becomes more crowded each time. We made it at E-Government National Center of Brunei Darussalam as just a Change. We will make this happen once a month as a recurring event which is open for everyone to participate. focusing specifically on the Microsoft SharePoint Technology which is becomes popular day by day. each event we will pick two topics picked by the suggestions of participants and the forum panel. I was talking about the SharePoint 2013 Capabilities under the topic of “Flash Back to SharePoint 2013” in order to bring everyone on to the same page. it was nice to see that everyone enjoyed it and the feedback was great. Here are some of the Snaps from the Event ! I Will be Speaking There ! It’s a Great feeling that we were finally able to fix the date and Kick Start our Very First Event. 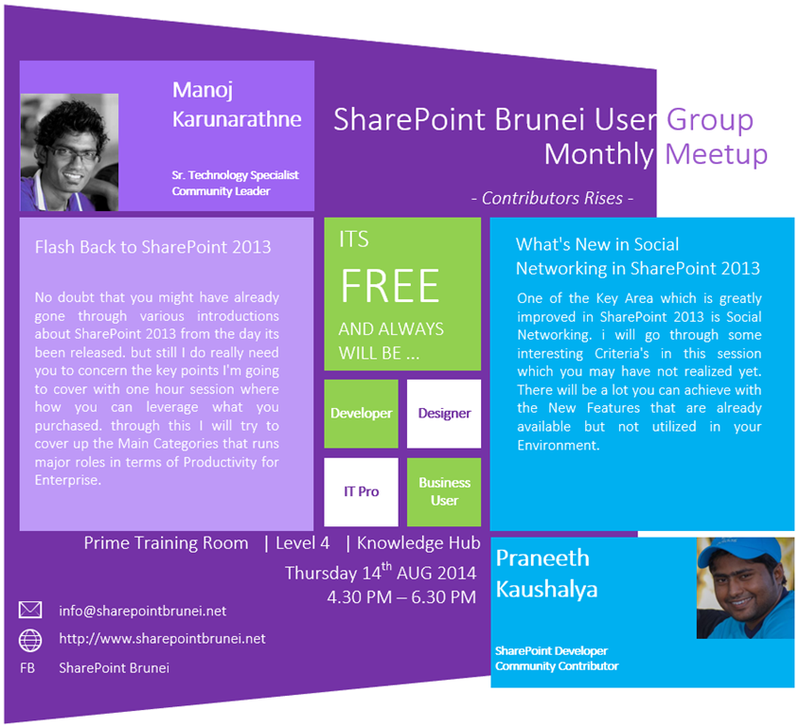 SharePoint Brunei User Group is the Very First Community Event for Microsoft SharePoint and Related Technologies in Brunei Darussalam. It will be a monthly recurring event where anyone who interested can participate. Each Day two sessions will be held which are picked by community contributors and also based on the comments of the participants too. It’s known that SharePoint is a vast Technology with various capabilities. At each meet-up we will take two specific criteria’s to discuss in depth which will make you a proper understanding on the same. The schedule for the August 2014 Meet-up as below.